Before I get started I just want to say that the Mayweather/Canelo fight is a unanimous decision victory for Floyd regardless of CJ Ross’ inept scoring. By now everyone is wondering who Floyd will fight next in May of 2014. Cinco De Mayo is a traditional Mexican holiday that Floyd on several occasions has chosen to fight on, and has fought non-Mexicans on that date. Fans can expect an undercard loaded with Mexican fighters if Floyd elects to fight a non-Mexican on that date. Floyd could also elect to fight on another May 2014 date all-together. Danny Garcia – Matthysee will enforce his rematch clause. But does anybody believe that Garcia can beat Mayweather? NO! Devon Alexander – another guy without a fan base or a hope of beating Mayweather. Tentatively scheduled to fight Amir Khan, but that is changing as we speak. Amir Khan – decent fan base, chinny, no hope of beating Mayweather. May bypass Alexander all-together in hopes of landing the Mayweather assignment. Khan will be made to think that he’s going to get the nod and then there’ll be a bait and switch. Khan will end up fighting the Garcia/Matthysee rematch winner on the undercard of Mayweather’s May 2014 fight. Sergio Martinez – currently on the shelf rehabbing his surgically repaired right knee, will fight again in 2014. Martinez wants to cash-out on his boxing career and would like nothing better then to fight Mayweather for a ‘larger than life’ payday. Manny Pacquiao – On course to face Brandon Rios in November 2013. If he wins this one dominantly he could get the Mayweather assignment if his promoter doesn’t get in the way. Rios wins this one by KO, forcing Pacquiao into retirement. 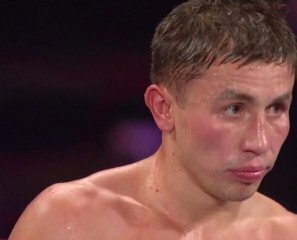 Gennady Golovkin – Facing Curtis Steven’s in November 2013. This fight will end with Stevens face down on the ring canvas. After that fight ALL of the Mayweather naysayers, detractors, and HATERS will RELENTLESSLY call for Mayweather to FACE GGG or they’ll brand him a COWARD. Showtime seeing the PPV upside of a Mayweather/GGG fight will force the issue of this fight being made. Media HYPE and small talk is already being made about this fight happening. Having produced the largest PPV of all times in terms of revenue, Showtime will be looking to double down on their success and produce 1 more record breaking boxing event featuring Floyd ‘Money’ Mayweather. The ~1M PPV buys of the Mayweather/Guerrero fight won’t cut it, so, any fighter who Money Mayweather fights has to have a ‘larger than life’ chance of brutally beating him, and only two of the men on the list above pose that threat: GGG, and Sergio Martinez. After dominating African American fighter Curtis Stevens, the MEDIA HYPE will accelerate it’s build up of GGG as the man that will end Mayweather’s undefeated streak. GGG is NEXT! You are here: Home / Boxing News / GGG is NEXT! !